Sheerwind-Invelox, a ducted-turbine fiasco, officially went bust in early 2018. Incredibly, there are a number of promotional videos still on line at youtube.com and on vimeo. The latter is even more surprising since it's a pay to use platform. 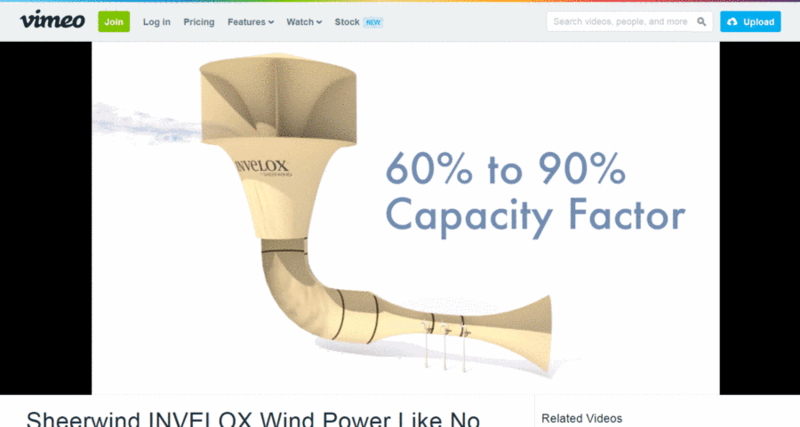 Sheerwind-Invelox's subscription must still be in force. That won't last forever. If you want to archive some of the most over-the-top, ducted wind turbine hype ever, follow the links and download these videos while they're still available. Track down the whole kit and caboodle at Sheerwind-Invelox Videos. For more on this ducted wind turbine hustle, see Sheerwind-Invelox.